Ravenna is off the main tourist routes, in flat, marshy uninteresting surroundings. If it was not for the mosaics, no-one would visit it. But it was once the capital of the Western Roman Empire, and that is why the mosaics are there. The Roman Empire was divided in the 4th century, with Constantinople the new capital in the east. Milan became the capital in the west, but then the Emperor Honorius, considering that Milan was too exposed, retreated to Ravenna on the east coast; protected from attack by the marshes and linked to Constantinople by the fleet. Honorius (reigned 395-413) was one of the most inept of all the emperors: it was during his disastrous reign that German tribes swept across the Rhine in 406 and Rome itself was sacked by Alaric’s Goths in 410. Honorius made no attempt to avert these catastrophes, but at least in Ravenna he was safe. 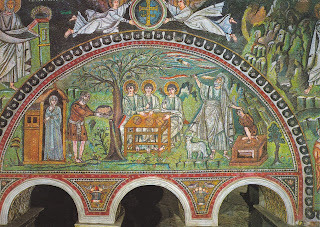 Honorius had a sister, Galla Placidia, who after a distinctly chequered career was buried in Ravenna, in a charming little mausoleum decorated with superb mosaics. 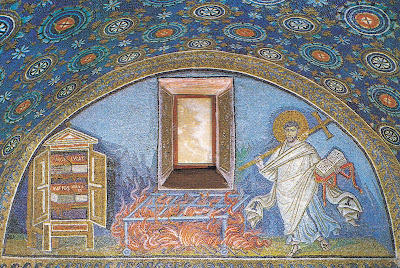 and facing him, St. Lawrence, with the gridiron on which he was barbecued alive. The Roman Empire in the west finally disappeared in 476, and a few years later Theoderic, King of the Ostrogoths, established a powerful kingdom in Italy, with Ravenna as its captal. He was generally on good terms with Constantinople, and made an effort to maintain Roman traditions. and an Orthodox one, now known as the Neonian baptistery. 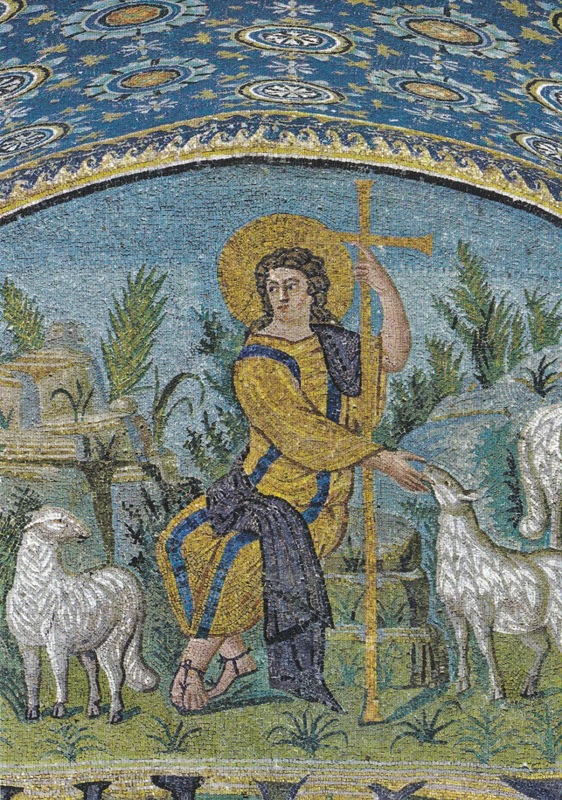 It will be noticed that in these early Christian mosaics, Jesus is always shown as a beardless youth. We are so accustomed to seeing an adult bearded Jesus that it comes as a surprise. I’m not sure when the “bearded” tradition begins. 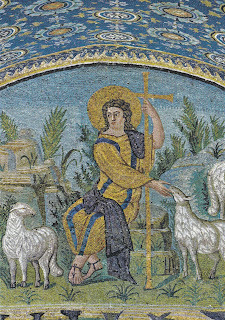 Arian churches were built, such as S. Apollinare Nuovo, which has magnificent mosaics. Theoderic died in 526 and was buried in an austere mausoleum on the outskirts of Ravenna. 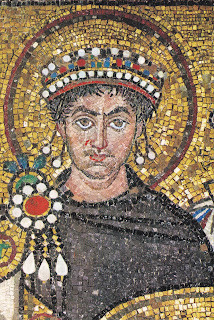 There followed a disputed succession, and the emperor at Constantinople, the great Justinian, decided to take advantage of this confusion to regain Italy for his empire (now more generally known as the Byzantine Empire), and sent his generals, Belisarius and then Narses, on a campaign of reconquest. This war lasted eighteen years, and was successful in the short term, but left Italy completely devastated. The situation was made worse by the onset of a plague epidemic and by climate change, with temperatures falling. Many historians would argue that it was the 530s, rather than the fall of Rome, which marked the real end of the classical world. The Goths retreated from Italy, but this only left room for the invasion of another German tribes, the Lombards, who gave their name to a region of northern Italy. 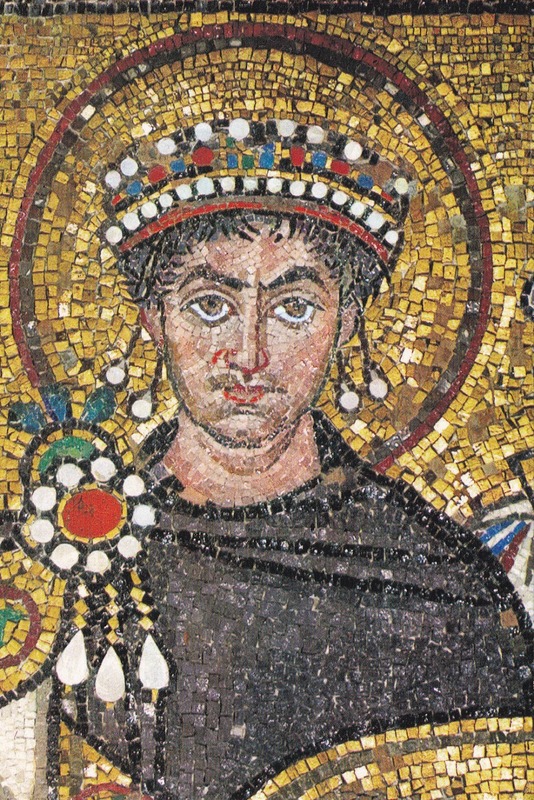 Ravenna continued to be the centre from which Justinian and his successors attempted to rule Italy. Arianism was suppressed, and existing churches were reconsecrated in the orthodox faith. with Christ the saviour in the apse (see the start of this essay) and the Lamb of God with angels on the ceiling. all surrounded with decorations of foliage, birds and abstract patterns. and facing him, his Empress Theodora, both flanked by their suites. Theodora began her career as a dancer in the circus; or, according to her enemies, a child prostitute. Ravenna fell to the Lombards in 751, depriving the Byzantine Empire of its last foothold in Italy, and the town quickly declined in importance. Its most famous later resident was Dante, the great poet and father of the Italian language. 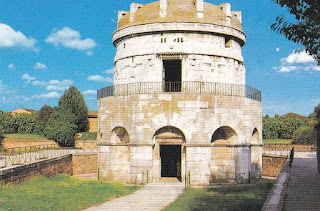 Driven from his native Florence after taking the wrong side in a political dispute, and threatened with a gruesome execution if he ever returned, Dante died in Ravenna in 1321, and his tomb is there. A lamp in his sepulchre is kept burning with oil from Florence. 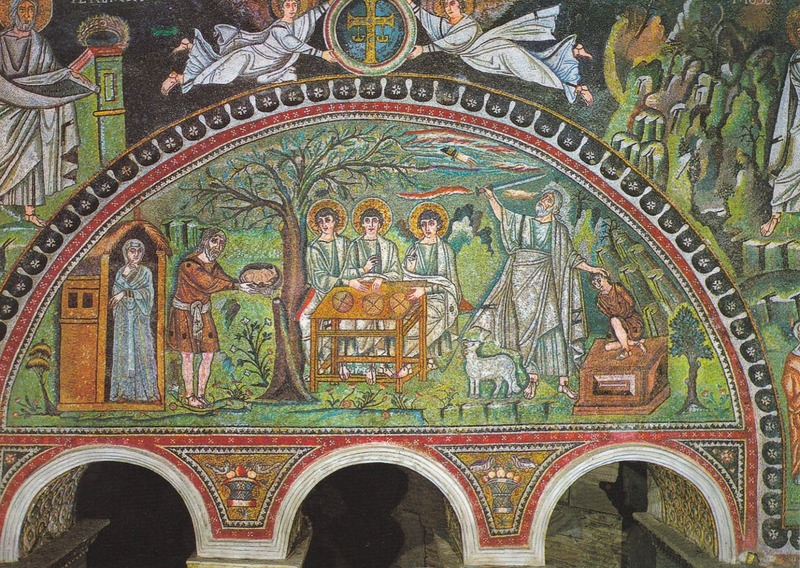 More recently, the Florentines asked for his body to be returned to them, a request which the people of Ravenna rejected.